Homer Smith (Sidney Poitier) is poor, unemployed, and living out of his car. By pure chance, he meets five struggling Eastern European nuns who eat little and don't even have a chapel for praying. It is nearly obvious from the beginning that the stern Mother Maria (Lilia Skala) cannot pay him for the work, but he starts building the chapel anyway. Why does a man who can't afford a home take on this tremendous task? The answer lies in the Homer Smith character, who is perfectly realized in a wonderful performance from Poitier. Based on the novel by William E. Barrett, Lilies of the Field is a fairly simple movie with only a few major characters, basic sets, and a small story concerning a chapel. However, it succeeds and immediately draws the audience into the lives of these characters. Homer is a drifter who wanders the earth in a beat-up car searching for a job. In actuality, he's also searching for something to believe in - a task that will give greater meaning to his life. Poitier (who won an Oscar�® for this performance) continues to add elements to his character as the story progresses, and this keeps him interesting and understandable. When Homer grows frustrated with the nuns and drives away, we can recognize his motivations for this action. During each progressive scene, the layers are pulled off this character to reveal the genuine and kind young man underneath. The central and binding relationship occurs between Homer and Mother Maria. She is a stubborn woman who ignores the information that she doesn't want to hear. When Homer asks for money or tells her they need bricks, she quickly moves to the next subject and moves on to other issues. What makes this relationship interesting is the inner struggles that she hides between the firm facade. While Homer keeps trying to convince himself to leave, Mother Maria tries to maintain hope that he'll stay. Through their arguments and compromises, they form an unlikely bond that carries the film. 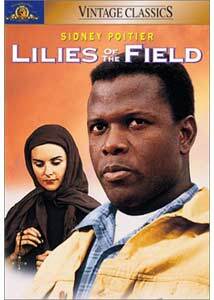 Lilies of the Field is also intriguing in terms of the predominant film culture at the time of its release. African-Americans seldom starred in major motion pictures, and Sidney Poitier was a significant exception at the time. While this movie hardly touches on the race issue (except for a laugh), it does represent a nice mix of cultures. Homer, the Eastern-European nuns, and the Spanish workers are all treated with respect and given equal footing in the story. In fact, the main object for ridicule is the Anglo-Saxon construction owner. While this obviously was a safe film for white audiences to enjoy in 1963, it still represents an impressive step by placing an African-American in the lead role. Poitier makes him a full-fledged character, with thoughts, dreams, and considerable abilities. One could criticize this film for its mostly lighthearted take on the subjects of poverty and religion. While the nuns are struggling to survive, this is nothing on the level of The Grapes of Wrath. However, its less serious tone is one of the highlights of this story, as it reveals interesting characters without becoming heavy-handed or overly melodramatic. Anchored by a classic performance from Sidney Poitier, is a well-written, enjoyable film that shines with a positive message. Audio Transfer Review: Dialogue covers much of this story, but a few moments do utilize more elements of the audio transfer. The best scenes involve the singing interludes with Homer and the nuns. Even within the limits of the mono track, their harmonized voices sound excellent. While the audio obviously remains fairly centralized, it once again improves over many of the transfers from this time period. Extras Review: This is a bare-bones release from MGM, and it includes the theatrical trailer as the lone extra on the disc. Lilies of the Field works because it creates full-fledged characters who inhabit an enjoyable, mostly positive society where miracles do occur. While this disc would have benefited from extra features, it does contain a pristine black-and-white widescreen transfer and nice sound to complement the uplifting story.